Sold by the listing broker to the current owners 24 years ago, COMANCHE remains an icon in yachting circles. She was built as the second of two GALLANT LADY Feadship Sportfisherman. At the time of her build there were no larger pedigree Yacht Fisherman on the water. While the market has dictated newer larger and faster Sportfisherman none have the class, grace or quality of a Feadship. Largely in fact to her original design only systems have been upgraded. Her original Feadship features remain. Your chance to own an icon. To port aft are two oversize built in upholstered chairs separated by a built in end table. Just aft of the table is the Salon s entertainment electronics to include a Yamaha AV receiver with Blue Tooth connectivity, six channel Surround Sound, a Direct TV HD DVR, receiver, an Audiovox DVD player and two USB charger outlets for phones/iPads. Facing the couch is a newer Samsung 46 LED TV that can be hidden behind tambour doors as desired. Forward just before the Master Cabin entrance is a hinged step to the forward bilge area under the Master Cabin. Built in shelving allows for weeks of ship s stores and spares. This area is well lit, encompasses the bow thruster tube and hydraulic pump as well as the forward tank tops. Also in this area is a safe. Entered from the aft end, looking forward are twin oversize 34 wide lower berths with a three door nightstand between. Entered via the forward end there are two bunks outboard. The upper bunk is 31 wide, the lower 35 . Below the lower bunk are two drawers. Above the lower bunk are four sliding storage cabinets. Each berth has a sconce type reading light. The shower has a hinged obscured glass door, 12 marble tiles to match the countertop, an obscured glass dead light with a removable storm cover, a handheld or wall mountable fixture, a light and an exhaust fan. The Master Cabin is all the way forward but well isolated from the bow noise due to the expansive Bosuns locker forward and storeroom below. At the foot of the Cabin is a cabinet with a Samsung 28 LED TV, a Yamaha, bookshelf style AM/FM/CD stereo behind a tambour door and a small refrigerator below. Next outboard is the entrance to the Master Head. The sole is mini mosaic tile with a marble border and wains coating behind the Head Hunter toilet. Slightly aft is a half height cedar lined hanging locker and three drawers below. The shower has a clear tempered glass door and is huge! There is a large seat, 12 marble tiles and a wall mounted gold plated Graff shower fixture. The sole is nonskid. Also in this area are twin 26 Samsung LED TV s wired for TV and also connected to the yacht s navigation screens. Interior screen mesh panels can be installed for sun protection when needed. In an effort to remove one possible impediment to a sale, COMANCHE was hauled for a bottom inspection/ultrasound. A Defelsko ultrasonic thickness gauge was used to test over 572 different carefully graphed stations in the underwater hull area by a noted local surveyor. In addition the props were pulled, Prop Speed added, shaft run out measured at the taper in place , all four strut bearings measured. 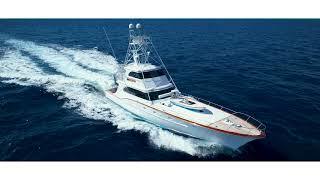 During 2005 COMANCHE received a complete Engine Room redesign and refit. Work included new engines, transmissions, generator, exhaust systems, pumps, HVAC systems and much more! At that time many of the boat s electronic systems (AV and navigation) were updated as well.